For the past couple of years, I have chosen a word for the year. Where a lot of people make resolutions and often drop them before the end of January, a word brings about a different kind of awareness. I learned of the idea from Christine Kane’s blog. The idea is to bring more awareness into your life about how you are living and how you want to grow. Rather than say "I will exercise more" and then beat yourself up for not doing that, you choose a word that embodies whatever it is you want more of in the coming year. It could be anything: ease, creativity, self-love, laughter, or clarity, for example. Then throughout the year you hold onto your word and, hopefully, realize that over time you are seeing a shift in your life. In 2009, I chose the word "focus" to help myself break some nervous habits and to teach myself to devote my attention to the task at hand and not get distracted. As that year came to a close, I started mulling over new words for 2010 and settled on "release" after being frustrated with an overflowing dresser drawer. What started off with me gathering things around the house for donation turned into me dropping things (quite literally releasing objects repeatedly) and, while still in January, I lost both my dog and my grandpa. At that point in time I decided I wasn't ready for "release." It was too much too fast and I began to think about changing words. I decided instead to go with "shine." This stemmed from a song my grandma and I used to sing when I was little: "This little light of mine, I'm going to let it shine." It felt like it was time to let myself be me without apology, without trying to fulfill anyone else's expectations- just to truly shine in myself. To a certain extent I think I've done that. I spent this year getting to know myself better and letting my true self come out for others to see. It has been an important step in my personal growth. Now I'm looking forward to 2011 and what I want for the coming year. I have a new word for the new year which I will share with you tomorrow. In the meantime, did you choose a word this year? If so, what came out of it? You can read what happened for others at Christine's blog. The year is drawing to a close very quickly, so I thought I'd look back and acknowledge what I was most thankful for in 2010. Check out my list at WorkingMother.com, then come back here and let me know what you are grateful for in 2010. It's Wishcasting Wednesday so the gorgeous soul Jamie Ridler is inviting us to cast our wishes into the universe and support others' wishes. Today Jamie asks, "What is your wish for the New Year?" I've been choosing my Word of the Year for 2011 which I will explain in more detail in coming days, so today's question is relatively easy for me to answer. I wish for happiness in the new year. Lots and lots of happiness for me, my family, and you as well. May you find joy and love in unexpected places. It's time to try something new. I've been blogging for nearly four years now. It started with a little Blogger blog called Life After Web. Then I added a Wordpress blog called On a Lighter Note. Then I decided two blogs were too much, so I combined the two into the Wordpress location and retitled it Life After Web. Two or three years ago I bought the URL lifeafterweb.com. Since then I've used it as a playground to try out a little web code here and there and for the past year it has been sitting there as some sort of odd landing page with no real purpose. I never bothered to move my blog there because Wordpress.com wouldn't let me redirect my old URL and I was afraid that you, my wonderful friends and readers, might think I got lost. If all goes well, a redirect is now possible and working. Life is changing a lot for me these days. That being said, it's time to make some changes to my blogging as well, so I am finally putting to good use the URL I purchased so long ago. It's time for a big girl URL. From now on, you will be able to read this blog at www.lifeafterweb.com. I hope you'll come visit the new space and let me know what you think. I've imported all my old posts, so you'll still see the same content you've always seen, just in a shiny new wrapper. Please be sure to update your bookmarks and RSS feeds. The design may still change some and the platform may also (for the time being, it's in Blogger), but this is what is right for now. I hope you will find the new space to be a comfortable place for you to visit, like the living room of a good friend where you know you can prop your feet up and restore your soul. I'll get the hot cocoa ready. It's Wishcasting Wednesday so the gorgeous soul Jamie Ridler is inviting us to cast our wishes and support others' wishes. Today Jamie asks, "What is your winter wish?" This one didn't take me long actually. With my baby son due near the end of January, I wish for a smooth final month of pregnancy, an easy delivery, and a graceful entrance to motherhood. I wish to embrace our new addition, to continue to support and be supported by my husband and stepson, and to ensure I remember to make time for myself. While wishing it also seems appropriate to take a minute to reflect on what I am thankful for. Today I am thankful for the cheerfulness of Christmas decorations. For lights and trees and stockings and garland and wreaths. I am thankful for the time I will get to spend with my husband and stepson in the coming week and I am thankful to be fortunate enough to have my current big decision be what we will eat on Christmas day. We are truly blessed. Experiment: Will Anyone Get Up for a Pregnant Woman? I was at the mall this weekend finishing up a little Christmas shopping. My husband and stepson were there also and we split up for a bit because my stepson wanted to shop for me. (So sweet and thoughtful!) We made arrangements to meet up in front of a particular store an hour later, which worked out nicely because there was a row of three couches there. I got to our meeting spot about 10 minutes early, so I thought I'd take the opportunity to rest my feet. After all, I'm now eight months into this pregnancy and carrying around much more weight than I'm used to. When I got there, however, all of the seats were full. Now I'm not the type to ask people to get up and I was content to stand while I waited, but I also thought it would be a good opportunity to run a little experiment to see if anyone would offer up a seat to the pregnant woman. I positioned myself at the end of the row where most everyone sitting would be able to see me and I set my bags on the ground. I should add that I was wearing leggings and a fitted sweater, so unless someone thinks I actually swallowed a basketball, it is very obvious that I am very pregnant. Let's also consider that this is Christmas time, generally a time of year when people may be feeling more generous. Did any of the four men occupying one couch get up? No. A few of them made eye contact, but that was it. Did any of the women occupying another couch get up? No. Some of them didn't notice me at all, though one made eye contact and looked away. But here's the kicker... did the woman closest to me, who had her packages on the couch next to her offer to move her packages so I could sit? No. Honestly, I was surprised, especially when it comes to the woman who took up seating with her shopping bags. How sad that courtesy and compassion has sunk this low, particularly at a time of cheer. After 5 or 6 minutes, someone got up to leave and I took their seat. Incidentally, it happened to be the seat on the other side of the shopping bags. And yes, I smiled at the woman across her shopping bags. Not a nasty, sneering smile, but a genuine smile. And I felt really good about it. Now let me restore your faith in humanity a little bit. After meeting back up with my husband and stepson, we went to Brookstone where between my belly, the bags I was carrying, and the mass of people in the store, I found it difficult to maneuver the small aisles, so I found a somewhat out of the way spot to stand while my men went to browse. I was standing there for probably two minutes when a Brookstone employee came over and asked if I'd like to sit in the massage chair. She explained that we couldn't run the chair since I'm pregnant, but she welcomed me to rest as long as I would like. Maybe kindness isn't dead yet. What do you think? Have you experienced or witnessed any seat offerings for pregnant women, the elderly, or otherwise? I just made Rice Krispy treats for the first time ever. Seriously. It's probably one of the most cliche desserts and the commercials always spoke of how easy it is to make them. So why have I never made them? I was afraid of working with gooey sticky melty marshmallows. I couldn't envision that going well. And yet today, I felt compelled to brave the Rice Krispy treat. I survived melting marshmallows, survived pressing sticky treats into a pan, and they are now cooling in the refrigerator. Hopefully they'll be delicious. I'm still scared to cut them. Haha! What silly little fear can you tackle this weekend? I've been reading The Happiness Project by Gretchen Rubin, which follows her journey through a year of trying various happiness resolutions. The biggest lesson I'm getting from the book isn't necessarily her particular resolutions, rather it is to stop and think before reacting in a situation. Throughout the book Gretchen gives some examples of irritating moments in daily family life.Like when her kids are bickering or when she or her husband are in a bad mood. You know those times. What I've found intriguing is that due to her happiness project, she was sometimes able to pause in that moment before reacting to look at things from a different point of view, then react more creatively. It's easy to yell or join the bickering or get defensive or say something resolutely to the moody party like, "then just fix it." In her moments of pause, however, Gretchen had the presence of mind to realize how she would normally react and realize that such a reaction may not solve the problem or may even add more stress to the situation. For example, when she found her two daughters arguing and crying, she marched to their room and almost told them to "knock it off" or some other such parentism. But she didn't. She stood in the doorway, realized that probably wouldn't actually make them stop, and instead said something like, "Crying always makes me thirsty. I'm going to get you girls some water." Soon they were all in the kitchen drinking water and Gretchen even got her girls to laugh. So that's the sort of mindfulness I'm trying to bring into my own life now. When I feel a gut reaction rising, I'm pausing (when I remember to) to ask myself if whatever I was about to say will actually help the situation. If the answer is no, I'm taking another minute to get creative with my responses. When my husband gets yet another work call on a night or weekend, rather than what has become my standard reaction (a huff or rolling my eyes or asking, "seriously? "), I'm trying to be more mindful of the fact that he's just as irritated about the interruption as I am. It doesn't help to have me adding my annoyance to the situation. Instead, I try to give him a sympathetic look as if to say, "I know it stinks that you are stuck working during free time." Or like yesterday, when my stepson came home from school hyper and without saying hello told me he was going to a friend's house, my gut reaction was to say something like, "Not even a hello? Just 'you're going to so-and-so's house? You didn't ask our permission. What other homework to you have? What about chores?" Instead, I paused. I realized a stream of questions and parentisms wasn't going to make for a lighter mood. I also realized that my stepson often says he has plans that turn out not to go through and this might just be another kids-talked-at-school-but-didn't-run-it-by-parents-yet situation. Having that moment really helped. From there we had a discussion about the school project for which he is partnered with the aforementioned friend and what they need to accomplish together. We talked about the good grade he got on a quiz and we discussed what homework he had. I asked him if his friend had spoken to his mother yet, to which the answer was no. So I sent him on his way to carry about his afternoon and asked him to get back to me when he had talked to his friend and to please let me know what time he would want me to drive him over and what time he needed to be picked up. No bickering. No struggle. And you know what? The plans never materialized, so had I gotten worked about it in the beginning, it would have all been for naught anyway. That Gretchen sure is onto something. You know how after you've been sick, there is one day that you realize you are better? Of course it can be a slow process so you may have a few days where you progressively feel a little better than the day before. But there is one day that you realize you are buzzing around with normal energy and it dawns on you that you feel great. Not just great, but the kind of huge great you can only feel after being sick. You know what I mean? I'll spare you the details, but Monday I woke up nauseous, had a really rough 24 hours, then Tuesday started to recover. Wednesday I was really tired and had no energy whatsoever. Even just walking a few steps left me winded. Today, however, I'm back. I just realized it. I woke up at 7:00 and have been steadily getting things done all morning. I even hauled my Christmas packages to the post office and went on a grocery run. While carrying the groceries in to the house, I realized I'm better. Hallelujah. These are the kind of days when you swear you'll never take your health for granted, even though eventually you probably will, until you find yourself sick again and realize "I don't truly appreciate those healthy days." So today I'm appreciating my health. With all my body and mind, I am thankful for my health. So thankful. Thankful for my energy. Thankful for my ability to eat and drink. And I'm so so thankful for my husband who took the very best care of me and never left my side. I'm a big fan of the Rose is Rose comic strip. I particularly liked last Sunday's edition. What a poignant reminder to put the technology down and really pay attention to what is around us. With the blogging break I took for much of the Fall, I've missed a bunch of Happy Book Fridays. Not this week! Jamie led The Happy Book group to page 96 to an exercise called "What would Joan Jett do?" The book asks us to think about who our idol is and what we imagine that person does to be happy. I chose Ellen DeGeneres whom I've adored from her early stand-up days, through her TV show and movies, and now to her talk show. She seems happier now than ever, so I think she's a great choice for this exercise. I'm going to see if I can put some of these into practice in my life and pay attention to how my own happiness is affected. In keeping with my daily gratitude practice, today I am thankful for a calm day- free of wind and obligations. I am thankful for my husband treating me to a package of Pecan Swirls even though he can't stand them. 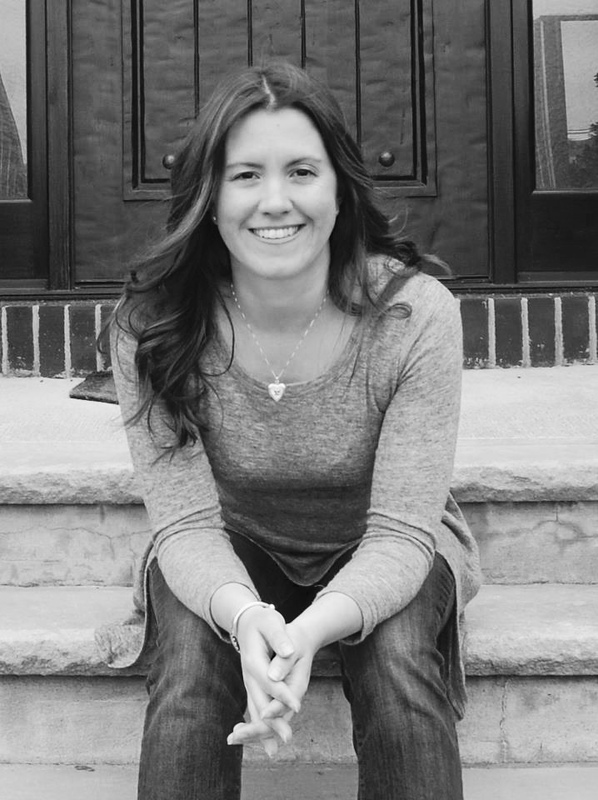 I am thankful for Jamie Ridler whose positive spirit is so inspiring. She dreams big and encourages all of us to do the same. Yesterday while supporting others wishes, I came across this post at Dashboard Hula by Shari Sherman. There were so many things about this post that resonated with me. First, her name is Shari. No matter the spelling, I'm always excited to find kindred Sherri's out there. I love my name. It has always felt magical, though I can't pinpoint exactly why. Moreso though, was her mermaid artwork (click through to her post to see it). She created a beautiful mermaid with lots of green and hints of pink (my two favorite colors) and adorned her with the message "Let your light shine." Finally, I liked that Shari identified herself as a turtle person and is learning to work with that essence of herself, rather than try to fight it to be something else. I think learning to be ourselves and work with our strengths is one of the best things we can do for ourselves. Continuing my effort to return to daily gratitudes, today I am thankful for my friend's baby born Tuesday morning, his health, and hers as well. I am thankful that though I am unable to visit her since she is in a different state, I have another friend who did go visit her and report back to me on the cuteness and well-being of both baby and new mom. It's Wishcasting Wednesday again where Jamie Ridler invites us to cast our wishes and support others' wishes. Today Jamie asks, "Where do you wish to go slow?" This question stumped me. Go slow? I have a baby due in 8 weeks, in-laws still living in what is supposed to be the baby's room, baby supply shopping to do, Christmas shopping to finish, gifts to ship across states, and Christmas decorations to put up. Meanwhile I'm getting bigger, slower, and less flexible by the day. Aaaaah! So that is exactly where I wish to go slow. I know that my in-laws have a couple prospects for moving (this part I hope goes fast), so I am trying to trust that this will happen and the baby's room will soon be vacant for us to clean, paint, assemble furniture, and prepare for our baby's arrival. My husband hopes we can do that during the week between Christmas and New Year's. I wish to slow down and enjoy the process of the holidays. I love decorating for Christmas and there is no rush. It's only December 1st. 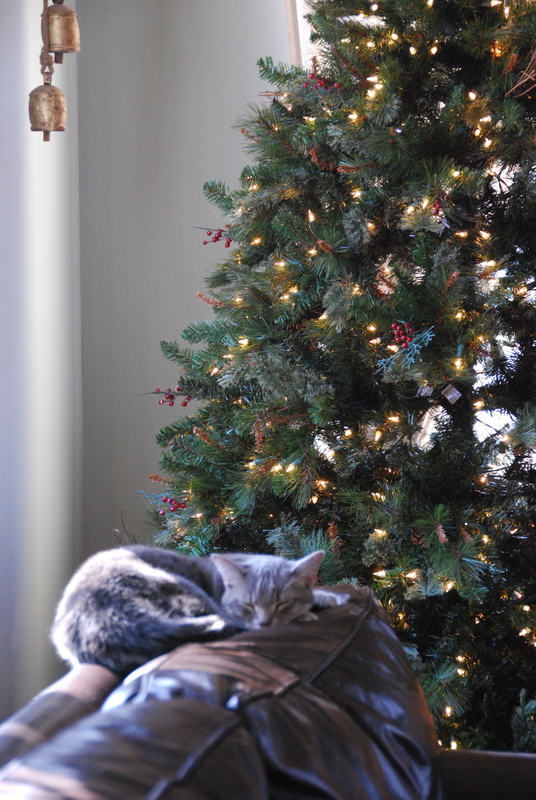 There is plenty of time to slowly unpack and carefully place nutcrackers, garland, and ornaments in the coming weeks. I have already wrapped a few gifts that I purchased early. I just received a shipment of gifts I ordered online, so I can leisurely wrap those over the next week and prepare them to ship to my friends and family. There is time. I can go slow and enjoy this over time, rather than needing to rush and get it all done in one day. And yes, I still have some gifts to figure out for my husband and stepson, but it will come to me if I slow down and lessen the pressure on myself to get it figured out and finished now, now, now. I just need to remember that I started early so that I wouldn't feel rushed. I can go slow with the remainder of my Christmas preparations. And honestly, no one will likely notice or care if it doesn't all get done. Yesterday I wrote about my desire to return to a practice of daily gratitudes. So here we go. [caption id="attachment_1456" align="alignright" width="230" caption="December 1/2 Price Offer"] [/caption]It's a new month, so I have a new Thirty-One special to share! During the month of December, for every $31 you spend, you can purchase one of the following items at half-price: flat iron case, hard case wallet, or mini on-the-go organizer. It's a great way to get a little extra something for yourself or add to a holiday gift (for example, buy a purse and get the half price wallet to make it extra special). 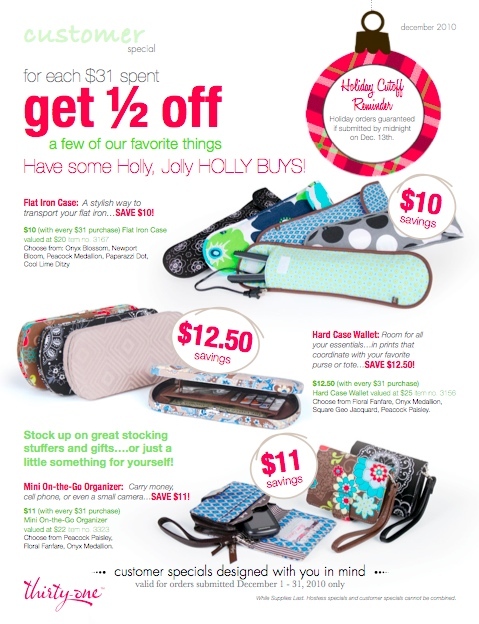 See the December flyer for details, then start shopping at my Thirty-One site. You'll find purses, organizing totes, weekend totes, baskets, and all sorts of gift-giving goodies. If you have any questions, email me at lifeafterweb at gmail dot com.